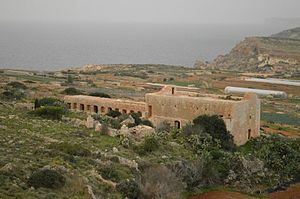 The Devil's Farmhouse, also known in Maltese as Ir-Razzett tax-Xitan, and officially as Ir-Razzett Tax-Xjaten (The Farmhouse of the Devils or The Devils' Farmhouse), is an 18th-century farmhouse in Mellieha, Malta. The farmhouse features two unconnected buildings. The original scope for the buildings were to function as stables and a horse-riding school (Cavalerizza). At one point the buildings were converted into farmhouses between different farmers, and the buildings underwent some structural changes. A national Maltese myth claims that it was built by the devil, a tale from which it derives its historic name. It is a national monument and in a dilapidated state. The Devil's Farmhouse was built in the 18th century during the rule of the Knights Hospitallers to be used as a horse stable. It is found in an area known as Ta' Randa very close to L-Ghar ta' Zamberat (Ta' Zamberat's Cave). The farmhouse stands away from urban development in isolation. 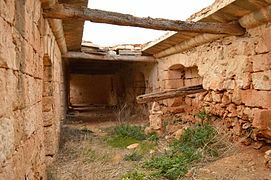 Attributed to the farmhouse is a Maltese myth that the farmhouse was built by the devil (or devils) in one day (or three days). The only architectural feature that gives the impression of relating to demonic icons are the two enclosed staircases, that lead to the roof of the stable, which are suggested to appear as two horns. Għandu denbu daqs ta' Randa. Very roughly translated, this text announces the feast of the devil at the site. The building has a simple and modest vernacular architecture, with slit windows, that function as ventilators, and waterspouts. It has no inscriptions or symbols to shed further information about its use apart from some roman numbers (i.e. I, II, III) that were inscribed when it was converted to a farmhouse. These are found on the walls and woods, and record the sale of products (different types of vegetables) of farmers with lack of education. The features of the building are good examples of Maltese traditional architecture that include, roofs built with limestone slabs and animal feeding mangers. 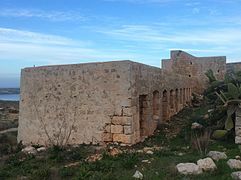 Despite the conversion to a farmhouse the building clearly does not resemble to be originally built to be used as such as it is not a traditional Maltese farm building. This and the position of the mangers (feed-trough) prove that the building was built for horses. These characteristics may suggest that the building may have been a cow farm. The high roof of one of the buildings still prove that it was unlikely to be built originally as a cow farm, but it may be speculative to say that at one point it had been so. It features two separate unconnected buildings, which may have been built during different periods. At the site, within the front of the farmhouse, stand two traditional giren which are built for bird hunting. The building was used as a hunting lodge and as a horse-riding school (Cavalerizza) by the knights to keep their horses inside. Other later additions inside the building are the wooden beams that were introduced to support the limestone slabs. The farmhouse is in a dilapidated state and is in need of restoration. Some of the roofs already collapsed while other are expected to collapse unless intervention takes place. Vella, Clifford (October 2013). 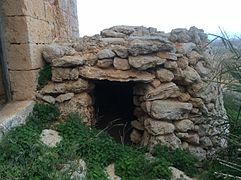 Leġġendi, Misteri u Għajdut mill-Gżejjer Maltin (in Maltese) (2 ed.). Pubblikazzjoni PIN. p. 27. ISBN 978-99957-020-8-3. ^ MEPA (June 2016). "North West Local Plans". Public Consultancy Draft. Malta Environment and Planning Authority (MEPA). ^ a b Zammit, Anne (2014), "Farmers and fireworks don't mix". Times of Malta. ^ a b Muscat, David (2013). "Mill-Migja tal-Gharab sa tmiem il-hakma tal-Ordni ta' San Gwann" (PDF). Imperial Band Club. p. 142. ^ a b Huxley, Michael (1986). The Geographical Magazine. 58. Geographical Press. p. 314. ^ a b c d e Mahoney, Leonardo (1996). 5,000 Years of Architecture in Malta. Valletta Publishing. pp. 123–124. ISBN 9789990958157. ^ a b c d e "Ir-Razzett tax-Xitan". ^ a b c Camilleri, Alex (2009). "It-Toponomastika ta' Malta: il-Mellieħa u Madwarha" (PDF). L-Imnara. 9 (4): 167. Archived from the original (PDF) on 4 March 2016. ^ a b c Bartolo, Evarist. "The Legend of the Farmhouse the Devils Built". Malta Inside Out. ^ Fenech, Doris. "Maltese Carnival". ^ a b Tabone, Timothy (2 March 2014). "Reject the application for fireworks factory". Times of Malta. ^ Said, Edward (2011). "Collapse of Naxxar building". Times of Malta. ^ Said, Edward (2012). "Government urged to protect historic building facing collapse". Times of Malta. ^ "Gazzetta tal-Gvern ta' Malta". Malta Environment and Planning Authority (MEPA). ^ Unknown (30 December 2012). "125 properties on National Inventory of the Cultural Property". The Malta Independent. Retrieved 10 March 2016.